Rose Coschignano/Pipe Dream Photographer Binghamton University’s annual Research Days commenced on Monday under the theme “Rethinking Research.” The series of events will run until Saturday, April 13. Working under the theme of “Rethinking Research,” Binghamton University’s annual Research Days commenced on Monday, April 8, highlighting scholarship and innovation happening on campus. Research Days is an annual series that highlights faculty and student research at BU and consists of open labs, poster sessions and speakers. Rachel Coker, an organizer of Research Days and director of the Office of Research Advancement, wrote in an email that Research Days allows the campus community to expand their knowledge on what work is being conducted at the University. “Ignite,” a speedy presentation series, was one of the events hosted for Research Days, and took place on Tuesday, April 9 at the University Union Undergrounds. 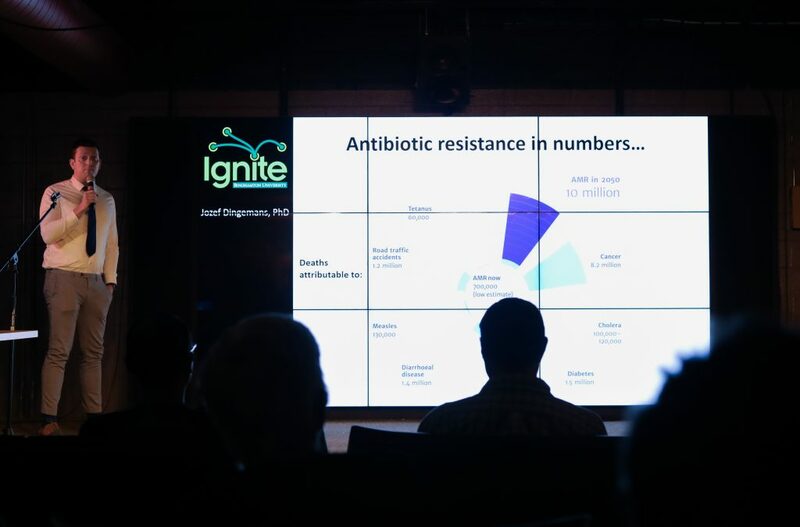 “Ignite” consisted of presentations by graduate student and postdoctoral researchers, who were allowed 20 slides that automatically changed every 15 seconds, cumulating to create a five-minute presentation. Rushui Fang, an “Ignite” presenter and a third-year graduate student studying electrical engineering, said participating in the event allowed him to practice his public speaking skills. The topics discussed ranged from Russian collusion in the 2016 election to the difference smartphones are making in the field of psychology. Robert Lawrence, a research development specialist for the Office of Strategic Research Initiatives, said “Ignite” is unique because of its format, as it challenges the speakers to be clear and succinct for the benefit of the audience. Upcoming Research Days events include a student-wide poster session, which will highlight research presentations from both undergraduate and graduate students, on Friday, April 12 in the Mandela Room. Additionally, “Technologies of Human Rights Representation” will be held on Saturday, April 13 at the BU Art Museum and will discuss the moral guidelines of human rights research. Coker wrote that she is excited to spend the week celebrating the research being conducted at BU.